Feng Shui 101: How To Bring Luck Into Your Home - Federal Land, Inc. Feng Shui 101: How To Bring Luck Into Your Home - Federal Land, Inc. 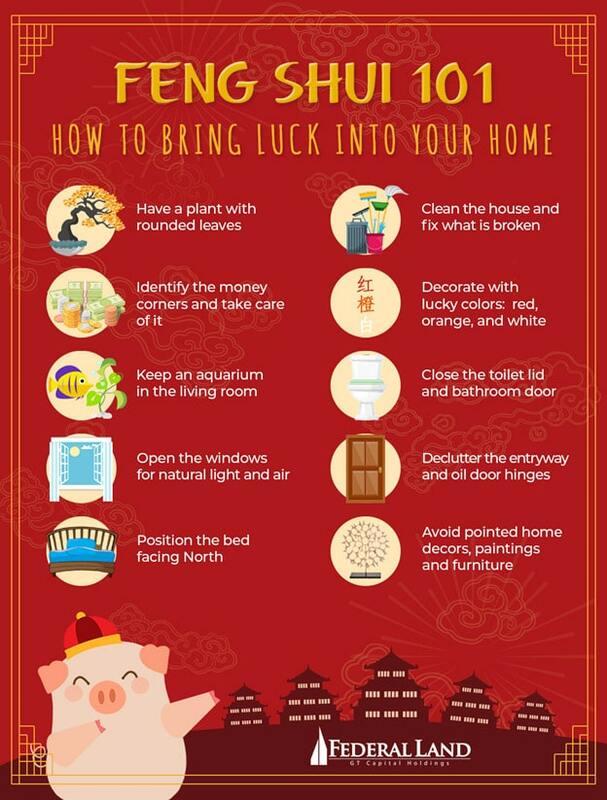 If you want to attract good luck, wealth and happiness into your home this coming Chinese lunar year of Earth Pig 2019, here are some simple feng shui cures you can do for your home without breaking the bank for charms or home renovations. Not only are they lovely additions to your home, but plants also purify air, attract positive energy and create home balance. Plants can be especially helpful to fill empty spaces that only accumulates dust and stagnant energy like the space above cabinets. If possible, choose plants with rounded leaves and avoid thorny plants like cacti. 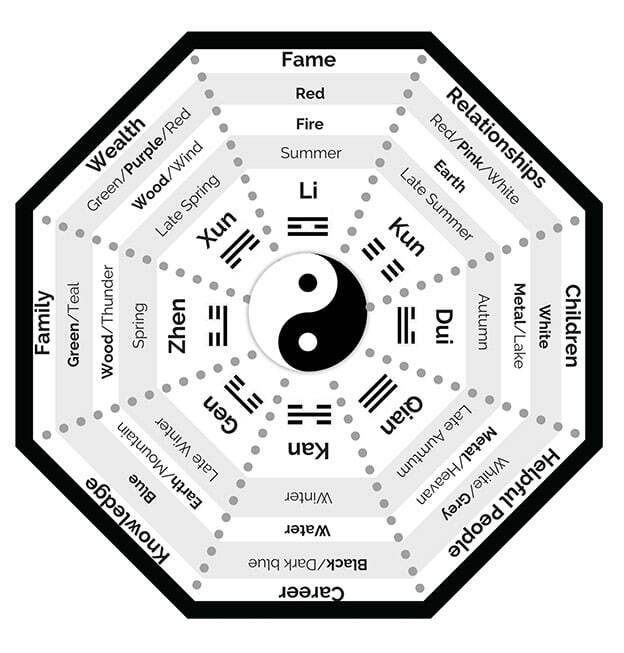 The Chinese Bagua identifies the southeast corner or the far left corner of your home as the Wealth Corner. The north corner or Career Corner is also considered as a money corner because a good career means a steady flow of income. To attract wealth, money corners must be kept clean and decorated with charms such as the wealth vase, laughing Buddha, gold coins, and other symbols of wealth. A well-maintained aquarium with colorful fish in the living room or in the front room of the house enhances money luck. The running water and colorful fish activate the auspicious “chi” or life energy and dissipate the “sha chi” or attacking energy. Never keep an aquarium in the kitchen, the bedroom nor the center of the house as it can bring sickness to your spouse and financial struggles for your breadwinner. In feng shui, windows are a gateway to opportunities. However, a dusty and closed window hides new experiences. Experts advise to keep it clean with a vinegar solution and old newspapers and to open it as much as possible to let natural light and air enter the house – attracting and creating harmony at home. The bed is the most important furniture in your home. When placed in the right location, it can bring you good fortune and a better quality of sleep. How to place your bed for good feng shui and better sleep? The head of the bed must always face North and should be positioned against a wall. Also, the head of the bed must not directly face a door. Most importantly, avoid sharp wall angles and pointed furniture edges near your bed. The sharp points emit constant “sha chi” or attacking energy resulting to illness and depression. Spring cleaning may be a modern addition to feng shui advice but it is one of the most important of a good home. A messy cluttered home surely does not invite good luck or good mood. Regularly cleaning rids your home of old energy, and attracts fresh and new “chi” or positive energy into your home. As much as possible, keep your furniture, appliances, lights, pipes and other stuff inside the house in tip-top condition. Anything not in proper working order should be repaired, removed or replaced to prevent negative “chi” from settling into your space. Shi Chi or low, decaying energy is present in houses that experience death, repressed emotions, a lot of clutter and lack of order. To purify your home of bad vibes and bad energy, it is important to have a space clearing session at least once a year. Fire and Metal elements will be periodically deficient during the year of Earth Pig. To correct that, wear the colors associated with Fire and Metal which are red, orange and pink (for Fire); white and golden (for Metal) for luck. The same thing can be said with decorating your home and office. To increase the chance of making more money and multiple success in 2019, decorate your home and office with different shades of red, orange and white. You can also add blue and green accents to symbolize Water and Wood elements. Water symbolizes wealth. However, the direction of water flow dictates where the wealth is going: whether towards you or away from you. A flushing toilet symbolizes flushing down wealth out of your home. Hence, you should always close the toilet lid and bathroom door after use to mitigate the outflow of wealth and good luck. If your home has more than one entrance, use the main door because it is the welcomes good “chi”. Your entryway should also be free from clutter such as packages, shoes, wet umbrellas or anything that could block the door. The clutter disrupts the flow energy, resulting instead to negative energy. Moreover, make sure you oil your door hinges whenever needed. Squeaking door hinges are considered the crying of a door – a sign of bad luck, preventing good chi from entering your front door. In feng shui, protruding pointed objects and sharp edges are considered dangerous. The sharp points, also called poison arrows, emit “sha chi” or attacking energy that can make you feel irritable and unsafe. Ideally, use only furniture and décor with rounded edges and avoid pointed objects such as paintings, sculptures, furniture, and thorny plants. If your existing furniture has sharp edges, look for ways to soften them. 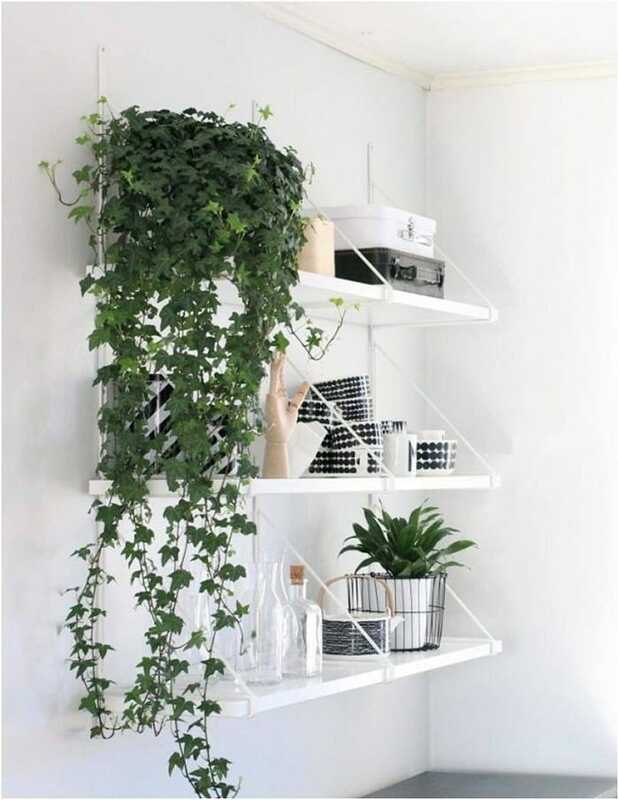 For instance, you can drape fabric over a table, add a vining plant to the shelf or place a lamp in room corners. You can turn the furniture or art diagonally to minimize the corner’s effect. 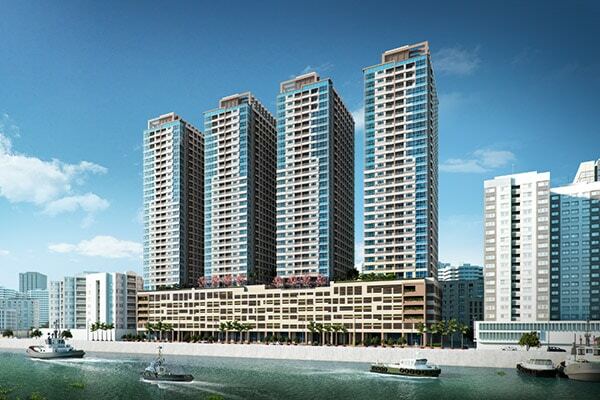 Designed to bring good feng shui to its residents, Four Season Riviera is a riverfront home with clear views of the historic Pasig River with clean, moving water gracing the homeowners with tidings of good luck. Peony Tower, the third tower of this real estate development, offers preselling condominium for sale. Peony boasts of generous living space perfect for families, retirees, professionals, business owners and foreign immigrants looking to assimilate into the thriving Filipino-Chinese community in Binondo. For pre-selling reservations, ready for occupancy units, or lease to own plans, email us at digital.mktg@federalland.ph for more details.